Melanin absorbs the light energy from Ultra VPLtm which creates a breakdown of melanin into smaller particles. The resultant ‘peppered’ spots are then sloughed by the constant natural turnover of skin cells leaving the skin more clear and smooth. Collagen is the substance in our bodies that keeps our skin looking youthful and smooth. The skin produces less and less collagen as we age. The appearance of fine lines and wrinkles are a result of this decrease. The light from the Ultra VPL tm stimulates cells in the body called fibroblasts to produce more collagen. As the collagen moves outwards, a smoother textural appearance, smaller pore size and reduced fine lines result on the skin’s surface. After a full consultation with a trained therapist, a comprehensive treatment program will be developed to best treat your condition. The area to be treated will be thoroughly cleansed and a cooling gel is applied to ensure that the light is used efficiently with maximum results. The Ultra VPL™ applicator will be placed onto your skin and flashed in a series of shots to treat the area. Most clients can return to their normal schedule almost immediately. It is advisable to stay out of the sun and away from tanning beds prior to treatment to ensure that your skin color is as close as possible to its natural color. Significant improvements will be seen in your skin condition with a regular course of treatments. The Ultra VPL™ treatment has been clinically proven to remove hair from all parts of the face and body. The variable settings mean that it can effectively treat the different types of hair found all over the body, from thicker underarm hair to finer facial hair. Pulses of red light are absorbed by the melanin pigment found in the hair. This absorption process produces heat which travels down into the hair follicle, destroying it and its ability to regenerate. 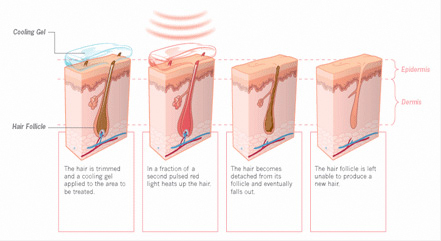 Hundreds of hair follicles are destroyed with each pulse, resulting in an easy and effective way to treat unwanted hair. The hair covering the treatment area will need to be shaved prior to the appointment or will be trimmed and a cooling gel applied ensuring that the light is used efficiently, to give maximum results from the treatment. The applicator is placed on the skin to be treated which is then exposed to a series of light pulses, flashing in rapid succession. In some areas the treatment can take as little as five minutes. The hairs treated will fall out naturally over a period of one to three weeks leaving your skin feeling smooth. Due to the growth period that all hair goes through, several treatments may be required to prevent hair growth in the treatment area. Your therapist will advise you on how many treatments you will likely need. All hair cycles are slightly different and some women, in different stages of their life, will sometimes find that some small hairs will appear gradually over time due to increased hormone activity. Periodic touch-up treatments are generally needed.